Near Southside Shindig - Near Southside, Inc.
Near Southside, Inc.’s Annual Shindig is the organization’s showcase event and primary fundraiser. The evening features the key projects, partners, and events that have shaped our district during the previous year and highlights the most anticipated projects for the year ahead. It's a lively evening that celebrates the partnerships and people that make the Near Southside an incredible neighborhood. This year we focus on one of the most significant and perhaps underappreciated factors behind the Near Southside’s remarkable and continuing revitalization: the impact and accomplishments of exceptional women. Join us to celebrate the developers, volunteers, small business owners, artists, community leaders, visionaries, doctors, advocates, investors, designers, builders, neighbors, baristas, bartenders, board members, and many more whose work played a role in shaping the district we enjoy today, and those currently transforming the Near Southside of the future. Some will be familiar faces, but we also look forward to shining the spotlight on the unsung heroines of our district’s story. It will be an honor to introduce and celebrate this impressive team of women. Each year, Near Southside, Inc. throws a party – known as the Shindig – to celebrate the incredible people who are guiding our community and our district’s success. The evening is equal parts celebration of recent accomplishments and call-to-action for the projects and ideas that advance our goals for the year ahead. Most importantly, the Shindig is our only annual fundraiser and pivotal in making Near Southside, Inc.’s work on your behalf possible. The 2019 Near Southside Shindig will be held on Friday, May 24, at the Omni Fort Worth Hotel. We hope you will mark your calendar and plan to participate as a sponsor. 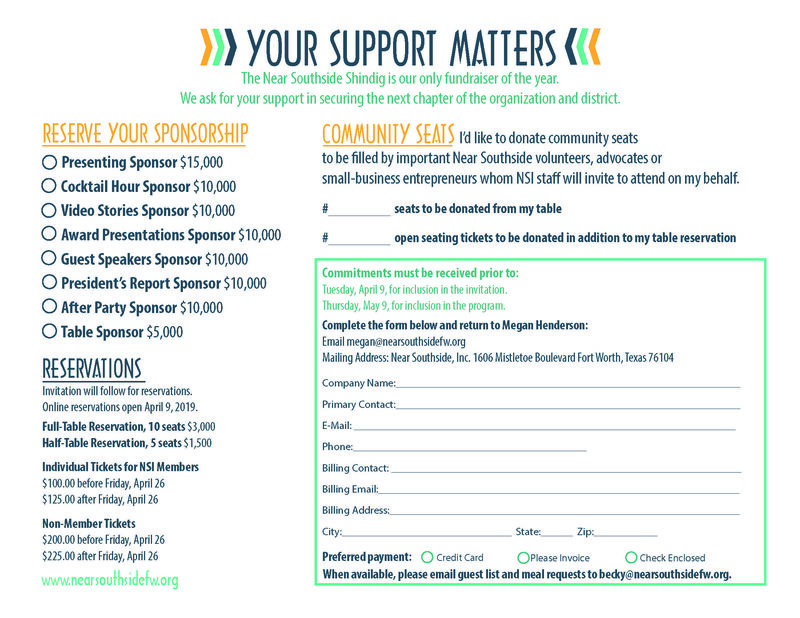 Your sponsorship not only provides for Near Southside, Inc.’s continued leadership and advocacy, but it also delivers a compelling evening of programming sure to inspire all in attendance. Over the past year, development has accelerated throughout the Near Southside at an astounding pace, with small businesses opening, medical centers expanding, residential options increasing, and urban villages transforming before our eyes. The transformation underway today has required decades of committed investment from leaders like you, but our work isn’t done. Behind the scenes, the team at Near Southside, Inc. is partnering to lead and assist development projects and to attract thousands through public events and community programs, ensuring that together we are creating the vibrant, urban community we want to call home. Today, the Near Southside is regularly celebrated as a model for overall growth and positive change in Fort Worth, highlighting how innovation, art, and the independent spirit have become some of our city’s most celebrated qualities. The results are visible and the word is spreading. This year’s Shindig will focus on one of the most signicant and perhaps underappreciated factors behind the Near Southside’s remarkable and continuing revitalization: the impact and accomplishments of exceptional women. Creating this dynamic environment has taken time and a lot of hard work from so many women. Developers, volunteers, small business owners, artists, community leaders, visionaries, doctors, advocates, investors, designers, builders, neighbors, baristas, bartenders, board members, and many more are creating a place that may appear to some as an overnight success, but we know better. The evening will highlight women whose work played a role in shaping the district we enjoy today, and those currently transforming the Near Southside of the future. Some will be familiar faces, but we also look forward to shining the spotlight on the unsung heroines of our district’s story. It will be an honor to introduce and celebrate this impressive team of women. We invite you to join us for an entertaining evening highlighting these city-shaping women, their projects, and their partners who serve as their advocates and allies. Your support makes our big evening possible. We hope you’ll make a commitment today as a 2019 Near Southside Shindig sponsor in appreciation of Near Southside women and the continuing work of our organization. 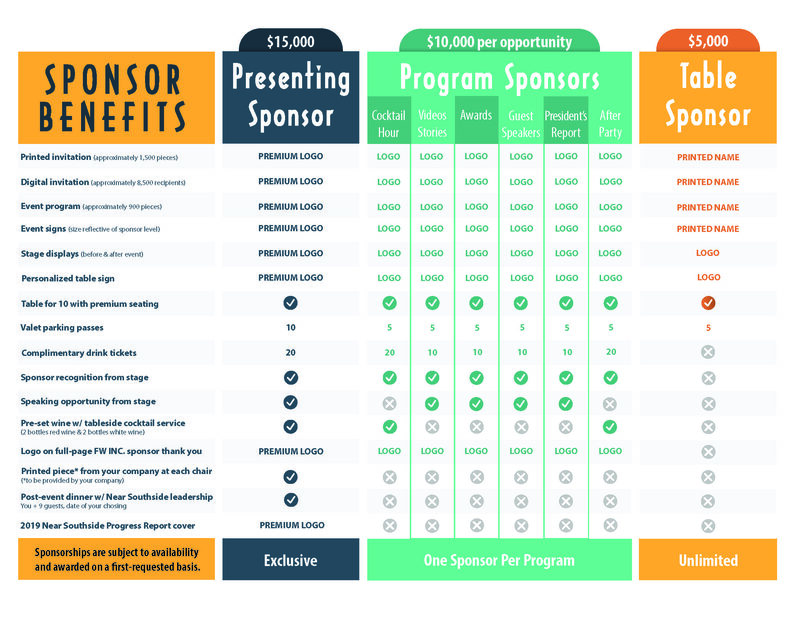 Please review the attached sponsor opportunities and benefits, and help us spread the word by sharing this event information with colleagues and friends who should also be in attendance. Don’t let this opportunity pass you by. Join us on May 24.